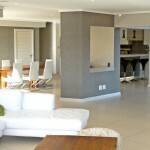 This well designed home, comprising of 4 en-suite bedrooms, open plan living area, well appointed kitchen, home automation, audio system and double garage, is available for self-catering holiday accommodation in the sought after low density private nature reserve of Pezula Private Estate. 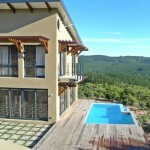 It is north facing and has uninterrupted tranquil views over the fynbos and indigenous forest. 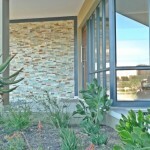 This property offers peace, quiet, space and comfort. The luxurious Pezula Resort Hotel and Spa, the championship Pezula Golf Course, the beach and the vibrant town of Knysna, with fine dining, shopping and numerous activities, in the heart of the Garden Route, are minutes drive away. George airport is 60 minutes away by car. Residents have access to multi-sport facilities including 4 tennis courts, a golf driving range, archery, petanque, softball, frisbee, volleyball and various other outdoor games. A barnyard, with horse riding is available on the Estate. These facilities are bookable through the Hotel, which also offers canoeing on the Noetzie River and hiking through the indigenous forest on the Estate. Noetzie Beach, 2km away, makes Pezula one of the ultimate luxury beach resorts and has been named one of the Top Three Beaches in South Africa. Spend time sunbathing, playing beach games, canoeing in the river mouth, or enjoying a beach picnic.